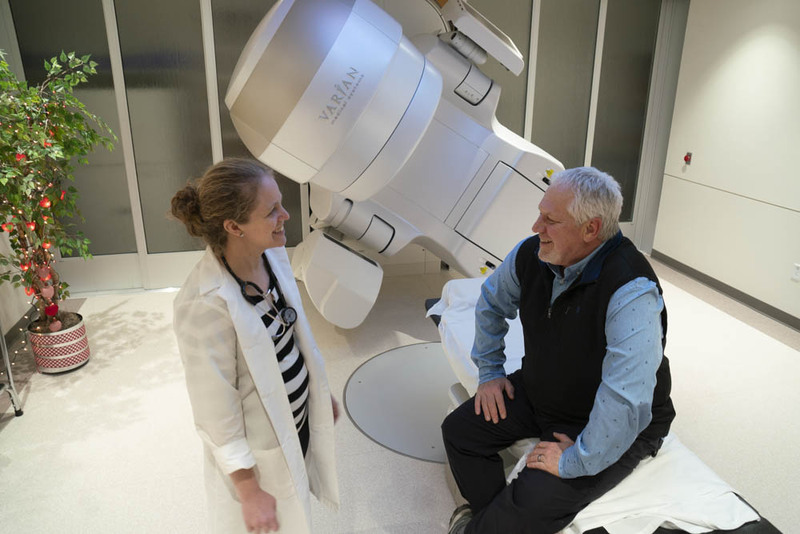 On Jan. 14, the UW Cancer Center Johnson Creek commenced cancer patient treatments in a freshly upgraded radiation oncology clinic. At the heart of this upgrade is a highly sophisticated and newly commissioned Varian TrueBeam Radiotherapy System. This state-of-the-art linear accelerator will enable the clinic to provide cancer patients in Southeastern Wisconsin convenient access to many high-precision radiation treatments available at the UW Carbone Cancer Center in Madison. Advanced imaging—The TrueBeam has an integrated imaging system. This enables clinic staff to capture patient images and compare them with images from the treatment plan to ensure treatment accuracy. A highly adjustable couch—The clinic’s new treatment couch can be adjusted in six dimensions. This reduces the need to move the patient manually and makes overall treatment times quicker. High-energy radiation—The TrueBeam can deliver high-energy radiation to treat tumors deep within the body. Optical Surface Monitoring System (OSMS)—This system uses three ceiling-mounted cameras to create a 3D model of the patient. The system compares this model to the images of the patient from the treatment plan. If the patient moves out of position, the system shuts off the treatment beam. Respiratory gating system—This video-based system uses an infrared camera that tracks a reflective marker on the patient. It enables clinicians to correlate tumor position to the patient’s breathing. This technology will enable Dr. Schuster and her staff to provide highly precise treatments, such as stereotactic radiation for early stage lung cancer and short-course prostate cancer treatment. Previously, patients often needed to travel to Madison to be treated with these state-of-the-art technologies. In years past, traveling to Madison was offered to cancer patients who might benefit. When an individual patient was deemed likely to benefit from an advanced technology at University Hospital, Dr. Schuster would discuss this opportunity. However, not all patients had the means and support to travel the additional distance each day.